Your Title Page in reports currently list the % each the goals are worth. It would be more useful (I think) to have that list (or option to list) the % completed. That way, you could use the TITLE page as a check list. Or, create an actual Checklist Report option. So you could print it off and manually check items off as you pack for a trip for example. Thanks for your suggestion – we may well consider adding the Progress data to the Report Contents (PDF and DOCX). Note though that for a simple 'task list' (or 'packing list') type of use you describe, you could use Export/Download to XLSX and sort by Progress. Or even, rather than doing a full report, you could use the Goal List feature available via the Highlight Sidebar (see first screenshot). 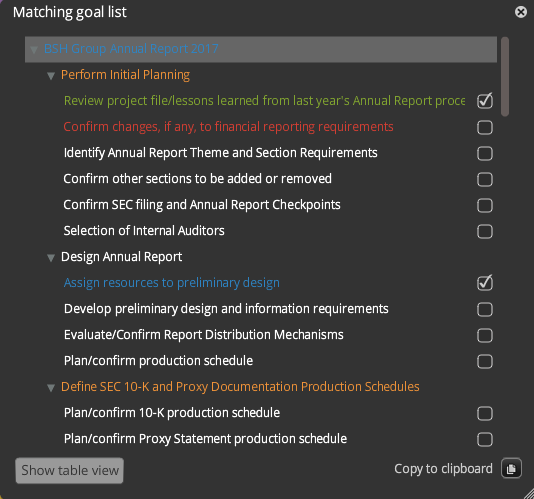 If you do not select any attributes in the Highlight Sidebar (or check 'Hide completed goals') to filter your goals, the goal list will contain all your goals (including any color-coding), with a checkbox to indicate those that are 100% complete (see second screenshot). And if you have set Dates on your goals, you can select Table view and reorder the goals by Name, Progress, Start or Due date (see third screenshot). 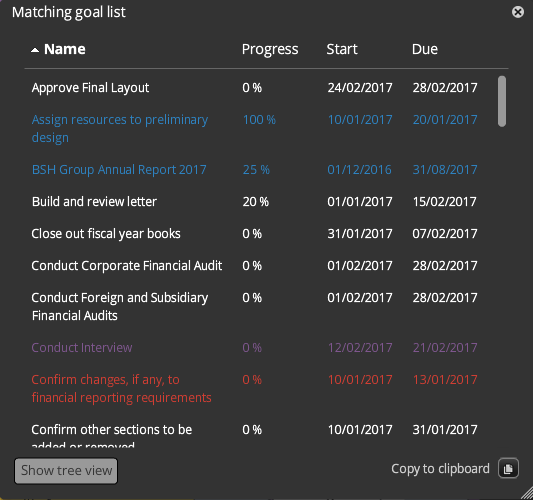 You can copy your goal list (or table) to the clipboard and paste it into any other app; and if you want a hard copy you can print it from there. Thanks. That Goal List is a nice workaround. Yes: it has a lot of different uses – and it too was a direct (and almost immediate) result of a customer suggestion! We are also looking at making the goal list accessible directly from the main screen, rather than via the Highlight Sidebar (although it will still reflect selections made in the Highlight Sidebar).